Georgia Tech intends to be a leader in sustainable issues and to promote action and awareness through education, research, and business practice. Georgia Tech’s 2020 – 2030 Strategic Plan for Sustainable Practice is a 10 year roadmap to create a sustainable campus. The plan was developed by an interdisciplinary campus cohort facilitated by the Office of Campus Sustainability and nominated by executive leadership. Scope: This category includes any campus operational practice that uses energy and emits airborne emissions. Vision: The Institute seeks to reduce its dependency of finite fossil fuels for operational practices and promotes energy and transportation options that support human health and contribute to a carbon neutral campus. Achieve a 15% reduction in emissions created directly by Institute activities (Scope 1 emissions) (2007 baseline). Develop a plan to optimize high efficiency heating equipment on campus by 2026. 75% of campus fleet to utilize alternative fuel options (non-fossil fuel vehicles) by 2030. Reduce total gasoline and diesel fuel consumption for campus equipment by 20% by 2030. Develop enforceable idling policy for campus fleet and vendor vehicles by 2023. Reduce total energy consumption in campus buildings by 30% BTU per square foot (2007 baseline). 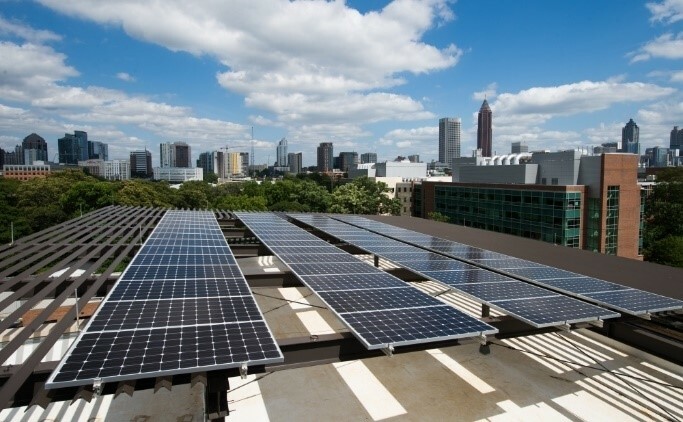 Set a sustainable thermal set-point standard for campus buildings by 2025. Implement energy efficiency standards and programs within the building and infrastructure design and operational process by 2030. Offset 5% of all energy consumed by campus facilities through renewable energy generation (2007 baseline). Create an energy resiliency plan to evaluate campus growth, explore low carbon energy sources, and identify needs, costs, and supply and management strategies by 2025. Incentivize the Georgia Tech community to use sustainable and/or active commuting options such as carpooling, public transit, biking, and walking. Review and expand upon the sustainable commuting incentives program with feedback from the campus community by 2025. Achieve Platinum Bicycle Friendly Campus recognition by 2030. 50% of staff use alternative and active transportation options as a primary commute mode by 2030. Develop carbon offset program for work-related travel by 2030. Scope: This category includes all water consumed on campus grounds or in campus buildings. Vision: Georgia Tech is a world class leader in water conservation practices, proven through consistent performance and reduction of potable water use on campus. The campus operates to protect and maintain the campus hydrological ecosystem including water basins, vegetation, and wildlife. Account for all sources and uses of water on campus (e.g., municipal, rainwater, condensate, greywater, well water, and blackwater). Conduct water infrastructure assessments to identify and improve water management and usage (continuous). Develop standards for water measurement and campus use; include the standards in existing building design and renewal standards by 2025. Reduce municipal water consumption by 40% gallons per square foot (2015 baseline). At least 40% of water use will be from non-potable sources by 2030. Prohibit the use of potable water in irrigation on established landscapes, with the exception of athletic fields, by 2030. Ensure that 100% of fixtures meet low flow standards in existing and new buildings by 2030. Develop campus-wide water metering-based educational programming designed to reduce water consumption by building occupants and residents by 2026. Develop a resiliency plan for campus water resources. Develop long-term strategy for reducing Georgia Tech’s use of potable water resources through conservation and reuse by 2025. Explore innovative technologies for water storage, use, and conservation (continuous). Advocate for policies at the city, state, regional, and national levels which ease restrictions around implementation of water reuse strategies (continuous). Capture or evaporate the first 1.2 inches of a rain event. Continue to implement the Eco-Commons and the Stormwater Management Plan by 2030. Develop partnerships with academic and/or community partners to explore the implementation of innovative green infrastructure strategies (continuous). Scope: This category encompasses all design, development, and operational processes and standards that support and manage the Institute’s vast portfolio of buildings, land, streets, and campus physical resources. Vision: Georgia Tech fosters a physical campus environment that defends safe, healthy, and accessible connections for all and supports the highest standards of design, construction, and operational efficiency and performance. Develop and implement a plan to increase and support campus biodiversity. Identify baseline conditions for campus biodiversity by FY 2021. Create an adaptive campus biodiversity plan to establish best practices, benchmarks, standards, goals, and strategies to meet and measure performance by FY 2021. Implement the campus biodiversity plan by FY 2022. Enhance the health of campus greenspaces and the utilization of campus outdoor spaces. Ensure all landscape projects follow standards set in the Green Book by FY 2020. Achieve a 55% tree canopy coverage of campus by 2030. Create a plan for improving and maintaining healthy soils on campus by FY 2021. Design and build outdoor spaces that are responsive to the cultural conditions and needs of the campus, with consult from the campus community (continuously). Reduce the campus community's exposure to toxic chemicals in indoor and outdoor environments. Achieve Institute-wide compliance with green cleaning standards by FY 2022. Inventory and track priority chemicals of concern used in campus operations and develop a plan to reduce exposure by FY 2026. Develop healthy materials vetting standards for design and construction projects and integrate into the Yellow Book by FY 2024. Research and implement the use of chemical-free forms of weed and pest management by FY 2024. Develop sustainability criteria for the maintenance, operation, and occupancy of buildings. Develop and implement high-performance standards and protocols for building maintenance and operation that comprehensively integrate sustainability principles by FY 2022. Develop and implement a space use policy that improves utilization of existing Institute buildings and plans for maximum efficiency and flexibility in new and renovation projects by FY 2022. Scope: The operational practices associated with this category include all material goods purchased with Institute funds and all waste stream processes by which materials leave campus property (reuse, recycling, disposal, compost, etc.). Also included are the procedures, policies, and contract processes associated with procurement and waste stream operational standards. Vision: Georgia Tech understands the lifecycle processes of materials and their environmental impacts. The Institute takes responsibility of materials that enter campus and ensures material streams support human and ecological health, and have a way to be recycled, reused, and repurposed rather than sent to a landfill. The campus strives to be a Zero Waste Campus where 95% of municipal waste streams are diverted from the landfill. Develop a Campus-Wide Materials Conservation Management Plan. Assess and develop standards for waste infrastructure and communications, taking into consideration the unique needs of different building types and feedback from the campus community by FY 2020. Research and pilot innovations in waste management by FY 2020. Become a zero waste campus (95% diversion). Divert 85% of construction and demolition waste from the landfill by FY 2020. Divert 75% of municipal campus waste streams from the landfill by FY 2029. Compost or reuse 100% of landscape waste by FY 2029. Achieve 25% sustainable spend in major purchasing categories by cost. Define standards for sustainable spend and integrate into vendor guidelines by FY 2021. Ensure 30% of food and beverage expenditures through Georgia Tech Dining are local and/or third party certified by FY 2021. Scope: Our people are our assets to achieve success across everything we do. This category supports the empowerment of our campus community and recognizes sustainable operations require education, awareness, communication, and accountability of our students, faculty, and staff in partnership toward shared goals. Success is also based on transparency and integration of sustainable principles into every facet of business practice and decision-making. Vision: The Georgia Tech community of students, faculty, and staff is empowered and engaged to contribute to sustainable outcomes on campus and understands the importance of sustainable actions. Tech utilizes our academic brain trust to create a Living-Learning-Laboratory on campus and invites our neighboring communities, the region, and the world to support us in our journey. Continue to embrace and adopt the values of sustainability into the administrative and business practices of the Institute. Create an interdisciplinary governance structure supported by Institute leadership that helps implement the Strategic Plan for Sustainable Practice. Embed sustainability into Georgia Tech’s governing and policy making bodies. Facilitate transparency and sharing of data and information across Institute operational portfolios. Engage and empower the campus community to contribute positive personal and institutional impacts to the world. Develop programming in support of cultivating a healthier, happier, and more sustainable campus community. Create visual identity of on-campus education and messaging for sustainable action that is consistent, constant, and reportable. Provide training and professional development opportunities about sustainability topics available to all staff at least once a year. Support initiatives to incorporate sustainability into academic classes and programs, and link research from sustainability fields into campus operations. Develop a coalition of community partners that support the Institute’s sustainability efforts and leverage learning and action for greater collective impact in our neighborhoods and region.